From all that we know about Kerala’s spectacle, there are no questions as to why it is popularly known as ‘God’s own country’. Blessed with hypnotic backwaters, unspoiled beaches which sees one of the best sunsets and dynamic cultural heritage, Kerala is the most celebrated holiday destination. Travelbug India is reminding you of all the reasons for visiting this paradise on Earth.Let nothing come between your rejoicing holiday spirit and a flawless vacation. So, read on the reasons which make Kerala the best holiday destination and book your Kerala holidays tour now! Ever wondered how serene it would be to laze through a houseboat as it cruises through emerald water lined with palm trees. Kerala holidays tour will leave you in awe with the rich flora and fauna and blissful villages which you will experience on your ride through the backwaters. Kerala tourism is highlighted as this coastal state is blessed with the heavenly backwaters in areas such as Alleppey, Kasargod, Kumarakom, etc. If you are looking for a seaside vacation to let go of your worries, Kerala’s beaches are the place to be. The landscape decorated with immaculate blue waters is a blessing to Kerala’s natural treasure. The pristine water calls out for a swim, you can also engage in snorkelling, fishing or simply sunbathe at the shore. Few serene beaches that you cannot miss on your Kerala holidays tour are Varkala, Marari, Kovalam, Payyambalam Beach, etc. Ways to relax are not limited on your thrilling Kerala holidays tour. An enchanting escape from the summers can be experienced in the tranquil hill stations of Kerala. Wayanad is an ideal romantic getaway because of its hypnotising rivers, thick forests and lush plantations. Munnar is another picturesque location with its high hills and exciting flora and fauna. Kerala is an absolute epitome of rich cultural heritage and traditional diversity. On your Kerala holidays tour, you will witness an assortment of well-preserved traditions and historic developments. 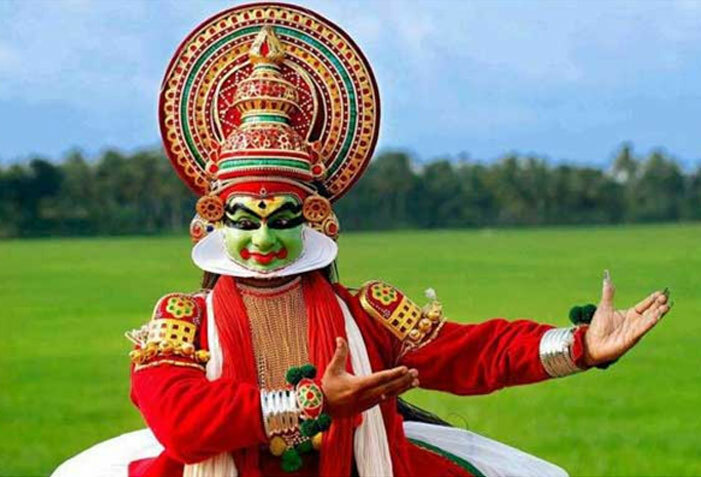 Kathakali is the classical dance-drama form which finds its roots in this cultural hub, and Kalaripayattu is the indigenous form of martial arts. Onam is the festival which is celebrated extravagantly with much enthusiasm. This developed State has the highest literacy and education level in India. The magnetic charm of Kerala allows you to do much more than relaxing on your Kerala holidays tour. This is a perfect location to head to for some thrilling adventures for adrenaline-driven souls. Periyar Tiger Reserve in Thekkady offers bamboo rafting along the river, enjoy wildlife safari through the thick jungles where you can spot exotic species of animals. The list of endless adventures on Kerala holidays tour is paragliding, scuba diving, snorkelling, trekking, kayaking, etc. Kerala is the true land of the ancient method of traditional medicine called Ayurveda. It offers vigorous living through holistic approach by application of oil, massage and yoga. An impeccable Kerala holidays tour must have you indulging in some relaxing Ayurvedic spa which will provide you with much needed unwinding. The magic of this treatment is powerful to cure several ailments and soothes your mind and body. Kerala holidays tour provides an excellent opportunity to discover the delicious flavours of authentic South Indian cuisine. The varied organic spices along with the coconut flavour enhances the elaborate dishes of Kerala. The popular culinary experience involves feasting on the traditional Sadya, appam and stew, Kerala beef curry along with Malabar parotta, Naadan Kozhi curry, to name a few. Apart from being a popular tourist destination, Kerala also offers unique and off the beaten path options for a luxurious and comfortable stay. Experience staying in the jungle amidst the tall trees and gushing river. Other interesting stay options are the enthralling houseboat tours in Alleppey, riverside cottages in Palakkulam, bamboo retreat and many more. The enticing stay options will ensure that you are closely interacting with the nature to create a perfect vacation to Kerala. All numerous facets of a holiday is packed into one extravagant Kerala holidays tour. The relaxation and delight offered by Kerala is unmatched. So book comfortable Kerala holidays tour with Travelbug India right away!